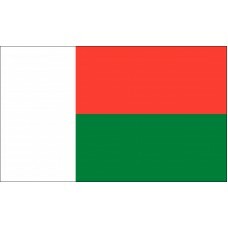 The Madagascar Flag features two horizontal bands in the colors of red and green and on the left-hand side of the flag is a white vertical band. 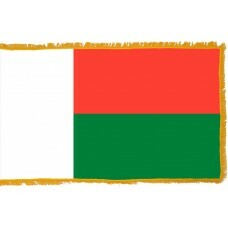 The colors, together, represent Madagascar's history, struggle for independence and its traditions and classes. The red and white colors were the colors of the Merina Kingdom (a state of Africa that ruled most of Madagascar by the 19th Century) and the green color was the color of Hova (the class of peasant Commoners). The Madagascar Flag was adopted on October 14th, 1958 (2 years before gaining independence) and as well as the other interpretations of the flag, the red color symbolizes power and sovereignty, the green color symbolizes hope for the country, and the white color symbolizes peace and purity. Madagascar is an island country in the Indian Ocean, off the coast of Africa (even though it was originally part of Asia) and is the fourth largest island in the world. It is one of the last countries where humans settled. The capital of Madagascar is called Antananarivo which is also the most populated city. The capital is also referred to sometimes as "Tana" which is its French colonial name. Madagascar is a country that mainly consists of mountains and rainforests and there are many various species of plants and animals that are unique to Madagascar and cannot be found anywhere else, such as the Madagascar Pochard, which is the rarest duck in the world. The biggest and smallest chameleons in the world can also be found here, as can the tomato frog which is one of the most colourful animals in the world. Since humans settled in Madagascar, it has lost over 80% of its rainforests. As well as the cutting of trees, a lot of people went there to explore and find gems as some of the world's highest quality sapphires were discovered in Madagascar. Madagascar was a very popular tourist destination but has declined over the years due to the frequent civil wars that have happened with the French following Madagascar's independence, which are also preventing the economy from growing. It is one of the poorest countries in Africa with a very poor health and education system and with the majority of the people living on less than $2 a day. The first European explorer to discover Madagascar was Marco Polo, who also named the island. In 1500, following Marco Polo's visit, the Portuguese arrived on the island, closely followed by the French, Dutch, and British, who all tried to establish settlements on the island but were not permitted. In 1883, the French invaded and attacked the island in what was known as the "Franco-Hora war." By 1895, Madagascar became a French colony and was completely ruled by France until 1957. The people of Madagascar did try to revolt against this in both 1918 and 1947but were unsuccessful until eventually gaining their independence in 1960.